Zoological conspiracy theories involving Israel are occasionally found in the media or on the Internet, typically in Muslim-majority countries, alleging use of animals by Israel to attack civilians or to conduct espionage. These conspiracies are often reported as evidence of a Zionist or Israeli plot. Examples include the December 2010 shark attacks in Egypt, Hezbollah claims of capturing Israeli spying eagles, and the 2011 capture in Saudi Arabia of a griffon vulture carrying an Israeli-labeled satellite tracking device. In December 2010, several shark attacks occurred off the South Sinai resort of Sharm el-Sheikh in Egypt. Following the attacks, in an interview on Tawfik Okasha's popular but controversial Egypt Today television show, a Captain Mustafa Ismail, introduced as "a famous diver," alleged that the GPS tracking device found on one of the sharks was in fact a "guiding device" planted by Israeli agents. Prompted in a television interview for comments, the governor of South Sinai, Mohammad Abdul Fadhil Shousha, initially said: "What is being said about the Mossad throwing the deadly shark [in the sea] to hit tourism in Egypt is not out of the question. But it needs time to confirm." The Israeli foreign ministry, in response, suggested that Shousha had seen "Jaws one time too many." The governor later dismissed any connection between the event and Israel. Describing the conspiracy connection to Israel as "sad," Professor Mahmoud Hanafy, a marine biologist at Suez Canal University, pointed out that GPS devices are used by marine biologists to track sharks, not to remote-control them. Egyptian officials suggested that the attacks were due to overfishing, illegal feeding, the dumping overboard of sheep carcasses, or unusually high water temperatures. Amr Yossef, adjunct professor of political science at the American University in Cairo, wrote that this and other similar conspiracy theories result from a misconception among the Egyptian public that Israel is all-powerful. Yossef wrote, "Notwithstanding that such allegations have no factual or logical grounds, no one stops to ask why should an Israel facing serious security challenges (Iran, Hamas, Hezbollah, etc.) busy itself with that kind of stuff." Birds (as well as other animals) are often tagged with GPS tracking devices or identification bands to record their movements for animal migration tracking and similar reasons. The high-resolution tracks available from a GPS-enabled system can potentially allow for tighter control of animal-borne communicable diseases such as the H5N1 strain of avian influenza. According to Ohad Hatzofe, an avian ecologist for the Israel's Nature and Parks Authority, the idea that tagged birds are used for spying is absurd. "Birds and other wildlife belongs to all of us and we have to cooperate," he stated. "Ignorance causes these stupid beliefs that they are used for spying." A griffon vulture similar to the ones captured in 2011 and 2016. The griffon vulture has nearly disappeared from the mountains of Israel and is the subject of a reintroduction project. As part of that project, vultures are tagged with radios and labels to keep track of the population. In 2011, a griffon vulture with a wingspan of about 8 feet (2.4 m) was caught by a hunter near Ha'il, Saudi Arabia wearing a GPS device and a "Tel Aviv University" leg tag. Rumors spread among locals, repeated in some Saudi newspapers, that the bird was sent by Israel to spy on the country. Prince Bandar bin Sultan, then Secretary General of the Saudi National Security Council, dismissed the rumors, said the equipment on the bird was simply there for scientific study, and that the bird would be quickly released. Saudi wildlife authorities agreed that the equipment was for solely scientific purposes. "Some Saudi journalists rushed in carrying the news of this bird for the sake of getting a scoop without checking the information… they should have asked the competent authorities about the bird before publishing such news," Bandar said at the time. Israeli officials described the rumor as "ludicrous" and said they were "stunned." A spokesman for Israel's Park and Nature Authority told the Israeli daily Ma'ariv that Israeli scientists use GPS devices to track migration routes. "The device does nothing more than receive and store basic data about the bird's whereabouts," he said. The Israeli ornithologist Yossi Leshem of Tel Aviv University said that this was the third such detention of a bird tracked by Israeli scientists in three decades. He reported that Sudanese authorities detained an Egyptian vulture in the late 1970s, and a white pelican in the early 1980s, both carrying Israeli equipment used for animal migration tracking. In January 2016, a griffon vulture with an Israeli tag was captured by residents of the Lebanese village of Bint Jbeil on suspicion of espionage after flying four kilometers (2.5 miles) across the border. The bird was tied by rope and, according to Lebanese security officials, checked for listening devices. The bird was later repatriated to Israel by UN peacekeepers. In May 2012, a dead European bee-eater with an Israeli leg-band, used by naturalists to track migratory birds, was found by villagers near the southeastern Turkish city of Gaziantep. The villagers worried that the bird may have carried a micro-chip from Israeli intelligence to spy on the area and alerted local officials. The head of the Agriculture and Livestock Provincial Directorate in Gaziantep, Akif Aslanpay, examined the corpse of the bee-eater and stated that he found that "the nose of the bird is very different and much lighter than others" and that it "can be used for audio and video," which, "in the case of Israel, they do." A counter-terrorism unit became involved before Turkey's agriculture ministry assured villagers that it is common to equip migratory birds with rings in order to track their movements. The BBC correspondent, Jonathan Head, ascribed the event to his view that "wildly implausible conspiracy theories take root easily in Turkey, with alleged Israeli plots among the most widely believed." In December 2012, a Sudanese newspaper reported that the Sudan government had captured a vulture in the town of Kereinek, which they said was an Israeli spy bird and was tagged in Hebrew and equipped with electronic devices. Iran's Press TV later claimed the bird was an eagle "equipped with Mossad's tracking and other surveillance devices." Ohad Hazofe, the avian ecologist, told Israeli news site Ynet: "This is a young vulture that was tagged, along with 100 others, in October. He has two wing bands and a German-made GPS chip." Hazofe denied that the device had any photographic capabilities. In an interview with CNN, he stated that "I'm not an intelligence expert, but what would be learned from putting a camera onto a vulture? You cannot control it. It's not a drone that you can send where you want. What would be the benefit of watching a vulture eat the insides of a dead camel?" In 2013, a kestrel was subjected to medical examinations at Firat University in Turkey after being identified as an "Israeli spy." The kestrel is frequent visitor to Israel and Turkey during the nesting season. In 2013, Hezbollah claimed to have captured Israeli spying eagles. In the same year, a kestrel carrying an Israeli foot band was discovered by villagers in the Elazığ Province, Turkey. Initially, medical personnel at Firat University identified the bird as "Israeli Spy" in their registration documents, however after thorough medical examinations, including X-ray scans, the bird was determined to be carrying no electronic equipment. No charges were filed and the kestrel was freed and allowed to continue its flight. A Bonelli's eagle, of the species that in 2011 was shot down in Lebanon with Hezbollah stating that it was an Israeli spy eagle. A rare tagged eagle from the Golan Heights Gamla nature reserve that was captured by Syrian opposition forces and first suspected of carrying electronic espionage devices was then returned to Israel on September 5, 2017 as a gesture in recognition of the medical treatment Israel has provided to Syrians during the Syrian Civil War. Among the mammals that have been cited in Israel-related animal conspiracy theories are swine, hyenas, rodents, and a dolphin. On several occasions, Palestinian Authority president Mahmoud Abbas accused Israel of releasing wild boars to destroy agricultural fields in the West Bank in order to cause damage to produce and intimidate Palestinian farmers. "Every night, they release wild pigs against us," Abbas was quoted as saying in one speech. An Israeli government official rejected the allegations, commenting that "It's a pity the Palestinian Authority president chooses to propagate such rubbish, and it raises questions about his real position on Israel." On May 5, 2016, a 10-year-old Palestinian girl was bitten on the hand either by a wild boar or a pig and suffered shock as a result. Palestinians blamed Israeli settlers for deliberately releasing boars in the West Bank to deliberately attack villagers as a way to keep them off their land, while others claimed that the Israeli West Bank barrier "affected the habitat of wild boars, possibly leading to higher concentrations of the animal's population in certain areas." In January 2016, Palestinians accused Israeli settlers of releasing wild hyenas in Jenin. The animals were killed by locals. In 2014, IDF soldiers found an abused hyena in Hebron and sent it to receive treatment in Israel. Three Palestinian abusers, from the village of Beit Ummar, were prosecuted. In July 2008, the official Palestinian news agency, Wafa, accused Israel of using "supernatural rats" that "can even chase away Arab cats" to encourage Arab residents of the Old City of Jerusalem to flee in panic. "Over the past two months, dozens of settlers come to the alleyways and streets of the Old City carrying iron cages full of rats," Wafa claimed. "They release the rats, which find shelter in open sewage systems." Hasan Khater, of the "Islamic-Christian Front for Defending Jerusalem and Holy Sites," claimed that Israel's goal was to "increase the suffering of the [Arabs] in Jerusalem by turning their lives into a real tragedy and forcing them to evict their homes and leave the city." Jerusalem Municipality spokesman Gidi Schmerling rejected the report as "pure fiction." The Irish columnist Ian O'Doherty wrote after the incident: "Terrifyingly, the rats even know the difference between Jew and Arab and they leave the Jews alone while terrorising the Arabs. Further proof, as if any were needed, that these Jews are just too sneaky for their own good. That, or the fact that Palestinian newspapers are perhaps a little biased in their coverage." "The Zionist entity gathered all the rats carrying the Bubonic plague in Norway, and released them in all the Egyptian provinces near the Sinai. According to several Egyptian sources, this operation took place in 1967, and these rats still exist in very large numbers. These rats breed very quickly and cause significant harm to crops. They devour these crops very quickly, and destroy grain silos. Even children are not safe from them. These rats often bite children's limbs. According to these sources, the Zionist entity, since the beginning of the normalization of its ties with Cairo, managed to smuggle chemical fertilizers and rotten seeds into Egypt, leading to the destruction of vast areas of soil and crops in Egypt. This is a well-planned strategic operation, with both short-term and long-term implications, but the clear goal is to annihilate the Arab world." The first accusation that Israel employs dolphins for espionage was made on August 19, 2015 when the Izz ad-Din al-Qassam Brigades of Hamas claimed they captured one wearing cameras and other equipment off the Gaza coast. One Palestinian report claimed that the dolphin was fitted with "killer arrows." Iran's Fars News Agency called it instead an "Israeli-made robot dolphin equipped with espionage equipment, including video-recording cameras." "Israel did not just stop at the bloody attacks against the Gaza Strip," the Arabic-language Palestinian daily al-Quds reported. "Now it has recruited a watery pet, the dolphin, known for his friendship with humans, to use for operations to kill Qassam Brigade Naval Commandos." 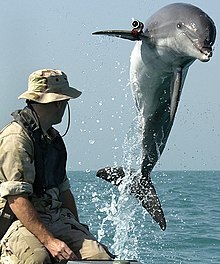 The Israel Defense Forces did not respond to the accusation, but Foreign Policy magazine noted that while "dolphins have been used by various militaries, including by both the United States and Russia, this report likely falls into what is a surprisingly fertile genre of conspiracy theories: the notion that Israeli intelligence routinely uses all manner of birds and other animals as tools of espionage." In February 2018, Hassan Firouzabadi, a military advisor to Iranian supreme leader Ali Khamenei, accused Western countries, including Israel, of spying on Iranian nuclear sites using lizards and chameleons, which according to him attract "atomic waves." "We found out that their skin attracts atomic waves and that they were nuclear spies who wanted to find out where inside the Islamic Republic of Iran we have uranium mines and where we are engaged in atomic activities," he said. Writing in The Times, James Hider linked the responses to the shark incident with those to the vulture incident and ascribed the reactions in Arab countries to "paranoia among Israel's enemies and its nominal friends," adding that "evidence of Mossad using animals is scant." Jackson Diehl of The Washington Post also linked the two events, writing that Arab media and officials who circulate fantasies of Mossad sharks and spy birds "deserve to be mocked." While mentioning Bret Stephens' theory, that the conspiracy theories are an example of "the debasement of the Arab mind," Diehl wrote that the paranoia in fact has also a more benign explanation, since Israel's real covert operations "are almost as fantastic as the fantasies." In 2011, Jihad el Khazen of the Lebanese newspaper Dar Al Hayat published a column analyzing recent animal related conspiracy theories, explaining that the concept of conspiracy is not particular to Arabs. According to Dar Al Hayat, people "always look for explanations that suit their prejudices or whims, even as such explanations often give truth, logic and reason a slap in the face." Gil Yaron wrote in The Toronto Star that "Many animals undoubtedly serve in Israel's army and security services: dogs sniff out bombs and alpaca help mountaineers carry their loads. [...] But tales about the use of sharks, birds, rodents or, as has also been claimed, insects in the service of the military are more the fruit of imagination than hard fact." ^ a b Okbi, Yasser (16 October 2013). "Hezbollah: We have captured an Israeli 'spy eagle' in Lebanon". The Jerusalem Post. Retrieved 27 January 2016. ^ a b Fathi, Yasmine (6 December 2010). "Expert shoots down conspiracy theory blaming Israel for shark attacks". Al Ahram. Retrieved 30 December 2010. ^ Waghorn, Dominic (7 December 2010). "Mossad Behind Egyptian Shark Attacks?". Sky News. Archived from the original on 15 September 2012. Retrieved 3 October 2012. ^ "Shark Attack in Egypt? Must Be the Work of Israeli Agents". Discover Magazine. ^ O'Sullivan, Arieh (6 December 2010). "Egypt: Sinai shark attacks could be Israeli plot". The Jerusalem Post. Retrieved 27 September 2012. ^ Strochlic, Nina (20 August 2015). "Hamas Arrests 'Israeli Spy' Dolphin". The Daily Beast. Retrieved 26 August 2015. ^ "Governor absolves Israel of shark attacks". Al-Masry Al-Youm. 20 December 2010. Retrieved 11 January 2011. ^ Yolande Knell (7 December 2010). "Shark attacks not linked to Mossad says Israel". BBC News. Retrieved 26 December 2010. ^ "Egypt to reopen beaches after deadly shark attack". Reuters. 12 December 2010. Retrieved 26 December 2010. ^ Office of Communications. "USGS Release: Satellites Help Scientists Track Migratory Birds: GPS the Latest Tool in Fight Against Avian Influenza (9/6/2006 9:38:16 AM)". ^ O'Sullivan, Arieh (11 August 2011). "White bird down leads to delicate rescue operation. Some see a spy in every GPS-carrying pelican, but Israel gives no credence to 'stupid belief'". The Jerusalem Post. Archived from the original on 24 September 2015. Retrieved 20 August 2015. ^ a b Gil Yaron (5 January 2011). "Secret agent vulture tale just the latest in animal plots". Toronto Star. ^ Haaretz Service (4 January 2011). "Saudi Arabia 'nabbed Israeli-tagged vulture for being Mossad spy'". Haaretz. ^ a b c "Saudi Arabia 'detains' Israeli vulture for spying". BBC. 5 January 2011. ^ "Saudis to free Israeli vulture". Emirates 24/7. 9 January 2011. Retrieved 20 August 2015. ^ Alexander Marquardt (10 January 2011). "Israeli Vulture Spy Declared Innocent By Saudi Arabia". ABC News. ^ Kintisch, Eli (13 January 2011). "Vulture Saudis Nabbed Was Third Israeli Bird Held Since 1975". Archived from the original on 16 May 2013. Retrieved 20 August 2015. ^ a b Diehl, Jackson (5 January 2011). "PostPartisan - Israel's Spying Vulture - and Killer Shark". The Washington Post. Retrieved 3 October 2012. ^ Erlichman, Erez (26 January 2016). "Israel fears for 'spy' vulture caught in Lebanon". Yedioth Ahronoth. Retrieved 26 January 2016. ^ "Lebanon returns Israeli vulture cleared of spying". BBC News. 30 January 2016. Retrieved 30 January 2016. ^ Kiliç, Yusuf (9 May 2012). "Gaziantep bird stand up!". Haberturk. Retrieved 1 February 2016. ^ "Turkey villagers see Israeli spy in migratory bird". BBC. 16 May 2012. Retrieved 3 October 2012. ^ "رادارات الخرطوم ترصد طيور التجسس وتعجز عن رصد الطائرات (بالعين المجردة)". ^ Robert Tait in Jerusalem (10 December 2012). "'Vulture spying for Israel' caught in Sudan". Telegraph.co.uk. ^ "Hamas captures Mossad's dolphin spying off Gaza". Press TV. 19 August 2015. Retrieved 25 August 2015. ^ ABC News. "Israeli 'Spy' Captured in Sudan". ABC News. ^ Thompson, Nick; Elbagir, Nima (12 December 2013). "Sudan: Israeli 'spy vulture' nabbed during reconnaissance mission". CNN. Retrieved 26 August 2015. ^ Vela, Justin (26 July 2013). "Turkey clears bird of spying for Israel". The Daily Telegraph. Retrieved 25 August 2015. ^ "Renegade bird accused of being an Israeli spy cleared after careful examination in Turkey". Hürriyet Daily News. 25 July 2013. Retrieved 26 August 2015. ^ Ben-David, Amir (September 8, 2017). "Eagle flies into Syria from Israel, returned by rebel fighters". Yedioth Ahronoth. Retrieved September 8, 2017. ^ "Abbas accuses Israel of using wild boars against Palestinians". Turkish Weekly. 22 November 2014. Archived from the original on 25 July 2015. Retrieved 24 August 2015. ^ Abu Toameh, Khaled; Keinon, Herb (22 November 2014). "Report: Abbas accuses Israel of using wild boars against Palestinians". The Jerusalem Post. Retrieved 24 August 2015. ^ a b "10-year-old Palestinian girl attacked by wild boar near Jenin". Ma'an News Agency. May 6, 2017. Retrieved May 8, 2017. ^ a b "Wild Pig Released by Israeli Settlers Attacks Child in West Bank". International Meddle East Media Center. May 6, 2017. Retrieved May 8, 2017. ^ Nazzal, Nasouh (January 6, 2016). "Jewish colonists release wild hyenas in Jenin". Gulf News. Retrieved January 8, 2017. ^ Erlichman, Erez (October 9, 2014). "Three Palestinians arrested for abusing hyena". Yedioth Ahronoth. Retrieved January 8, 2017. ^ a b O'Doherty, Ian (31 July 2008). "Save us from the Jewish rats". Irish Independent. Retrieved 25 August 2015. ^ Abu Toameh, Khaled (20 July 2008). "Palestinians: Israel uses rats against J'lem Arabs". The Jerusalem Post. Retrieved 24 August 2015. ^ "Jordanian TV Host Dr. Bakr Al-Abadi: Israel Released Norwegian Rats Carrying Bubonic Plague in Egypt, Develops Ebola". March 13, 2018. Retrieved March 27, 2018. ^ Osmo, Liad; Kais, Roi (19 August 2015). "Double agent dolphin: Hamas catches 'Israeli spy' at sea". Yedioth Ahronoth. Retrieved 24 August 2015. ^ "Hamas 'seizes Israeli spy dolphin' off Gaza". 20 August 2015. Retrieved 23 August 2015. ^ Campbell (20 August 2015). "Israeli 'spy dolphin equipped with killer arrows' captured by Palestinian militants". Daily Express. Retrieved 24 August 2015. ^ "Iran media outlet: Captured 'Mossad dolphin' a robot". The Times of Israel. 20 August 2015. Retrieved 20 August 2015. ^ Abdelaziz, Salma (21 August 2015). "Report: Hamas says Israelis used dolphin as spy". CNN. Retrieved 24 August 2015. ^ Groll, Elias (19 August 2015). "Fact-Checking Hamas's Claim That It Captured an Israeli Spy Dolphin". FP. Retrieved 25 August 2015. ^ "Iran accuses West of using lizards for nuclear spying". The Times of Israel. February 13, 2018. Retrieved February 14, 2018. ^ Leon, Eli (February 14, 2018). "Iran's ex-military chief: Israel sent lizards to spy on nuclear program". Israel Hayom. Retrieved February 14, 2008. ^ Hider, James (7 January 2011). "Vulture held as Mossad spy by Saudi Arabia". The Australian. ^ Jihad el Khazen (27 January 2011) "Ayoon Wa Azan (Conspiracy Theory)." Dar Al Hayat, International ed. (Beirut, Lebanon). Al Bawaba (Middle East) Ltd.
Hunter lured Israeli vulture with "dead sheep"
This page was last edited on 16 February 2019, at 19:48 (UTC).